The Sadie Hawkins Event in Solivita encouraged all of the female members of our club to ask a male member to be her partner. 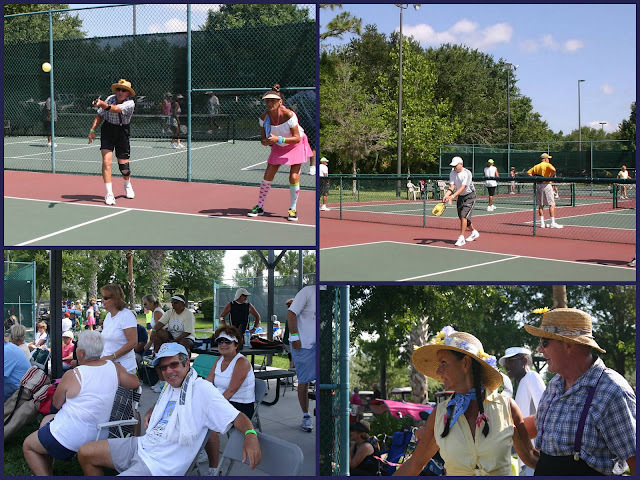 On Saturday, May 19, there were 90 participants and about 50 spectators. The "partners" were placed into nine groupings of five pairs of equal ability. The advanced, intermediate, and beginner players competed against each other in a round robin format within their own "grouping". Each team played 4 games and we did not reward the "winners" because of our desire to make it a social event. Lunch consisted of a hero sandwich, salad, chips and a beverage which was provided by our Pickleball Club. It was great but we should have had it in April to include more of our members that are snowbirds - next year. It was a fun day for all! On another note, a few weeks ago I went on a cruise to the Greek Isles on the Oceania with 102 other residents in the Solivita Travel Club. Below the Solivita crew all get to play pickleball for a few afternoons aboard the Oceania Marina Cruise Ship in Monemvasia, Greece.